There are many stories to this campaign and mine is from a Quaker and spiritual activist perspective. I first heard about fracking after the earthquake on the Fylde and local activism got started there. I used to visit New Horizons in St Annes and Ian R Crane came to speak and shared a lot of information about the oil and gas industry as he used to work for Schlumberger. Some of the misinformation that has been put around by the pro-frackers has been related to the wells we already have in the UK (prior to the recent test wells since 2010) which were for conventional extraction methods and not the unconventional method of fracturing the shale. The threat to our countryside by this extractive industry has woken up all kinds of people who intuitively know that this is so wrong and are getting connected with others of like mind. When our ground water is threatened as well as more air pollution from methane and toxic chemicals, noise and light pollution which will affect everyone living close to well sites then it is no wonder that there is no social licence! Governments must think that we are stupid if we would put up with this insanity of living in a gas field! Everywhere that has had this forced upon them on other continents have warned us not to let it happen. One well opens the door to thousands as that is what is required to make this industry work. My first taste of activism was at Barton Moss in Salford and I went to support the camp and also when there were deliveries. I did a few slow walks in front of the trucks down the public country lane to the site, one time holding a mirror to the police behind, to watch for any action. The solidarity days were inspirational too. For the last two years I had a wonderful adventure with the Nanas and latterly have been focusing my energy more locally. The indigenous peoples of North America have recently come together to prevent the North Dakota oil pipeline being constructed through sacred lands and have had worldwide support for their cause. It is so important that people of faith take their stewardship of the earth seriously and Quakers have shown an example of divestment by being the first religious group to divest substantial funds from fossil fuel investments. 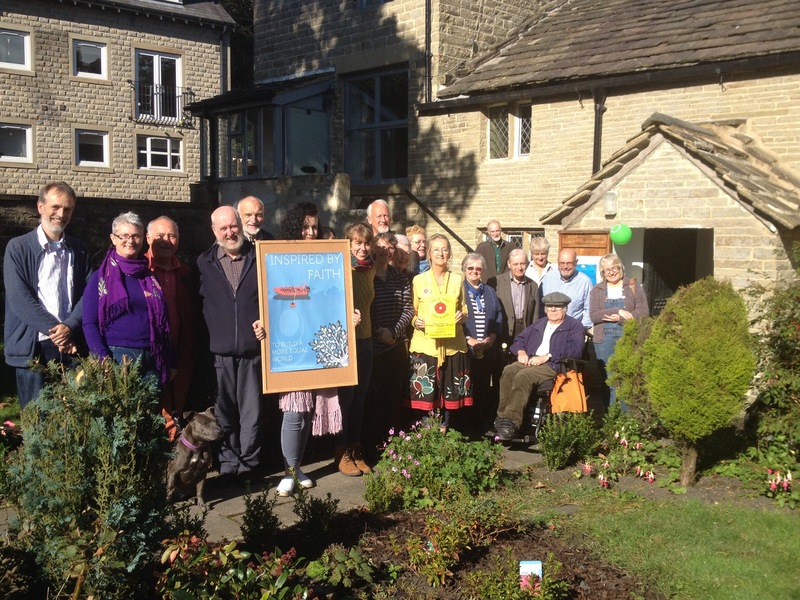 Many thanks to Sunniva Taylor for her Quaker work for sustainability as a Programme Manager for Quaker Peace and Social Witness and coming to talk to Pendle Hill Area Meeting on Climate Justice and Divestment at my local Meeting House. It was unfortunate that it clashed with the solidarity day Lancashire Responds at Preston New Road, near the site that has been given the go ahead. We took pictures in support and shared on social media. This month Friends of the Earth have a campaign from October 24-29 to #StopBarclaysFracking due to their 97% ownership of Third Energy in Yorkshire who were given permission to frack an old conventional well at Kirby Misperton. It is the system that is corrupt which allows lobbying by vested interests to destroy the earth for their own self interest. So it does need people to mobilise and talk to one another again to support the community against the Goliath of corporate power. They won at Balcombe in the summer of 2013 and since then the mobilisation of the anti-fracking movement and the general public has come to discover the true state of democracy. So with the overturn of local democracy by the Tory government in the Cuadrilla appeal and with more coming out about who has influenced the Secretary of State, we need more than ever to get organised. Local groups are coming together and people are inspiring one another. It feels a lot better than doing nothing about protecting the land for future generations! The spirit of humanity will shine through all this adversity I feel sure, if we connect through our hearts and learn to trust our intuition more.